Restore data to the same machine from which the backups were taken. Restore data to an alternate machine. 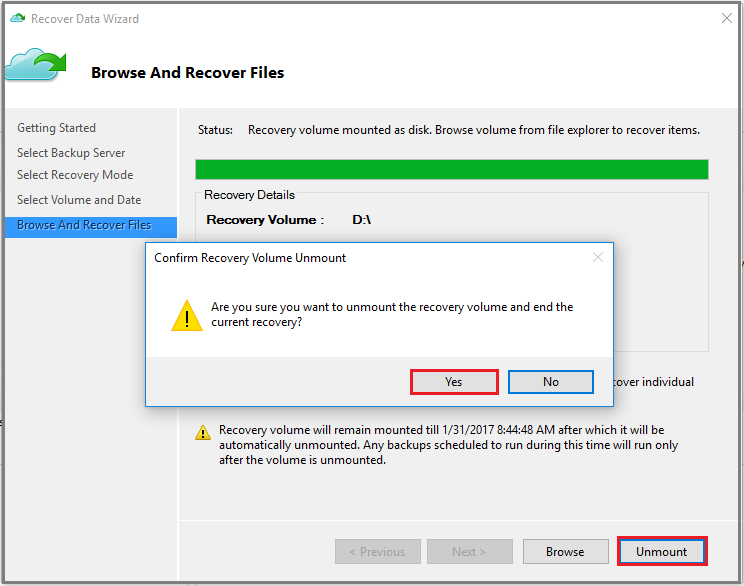 Use the Instant Restore feature to mount a writeable recovery point snapshot as a recovery volume. You can then explore the recovery volume and copy files to a local computer, thereby selectively restoring files. 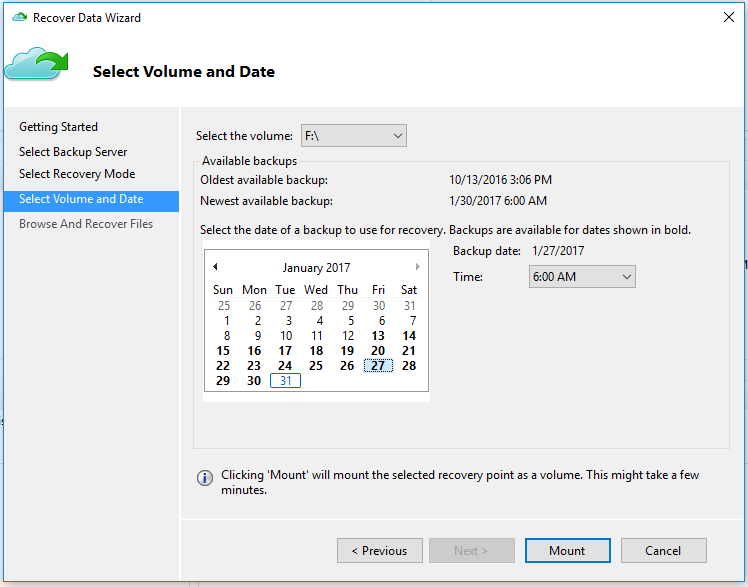 The January 2017 Azure Backup update is required if you want to use Instant Restore to restore data. Also, the backup data must be protected in vaults in locales listed in the support article. Consult the January 2017 Azure Backup update for the latest list of locales that support Instant Restore. Use Instant Restore with Recovery Services vaults in the Azure portal. If you stored data in Backup vaults, they have been converted to Recovery Services vaults. If you want to use Instant Restore, download the MARS update, and follow the procedures that mention Instant Restore. 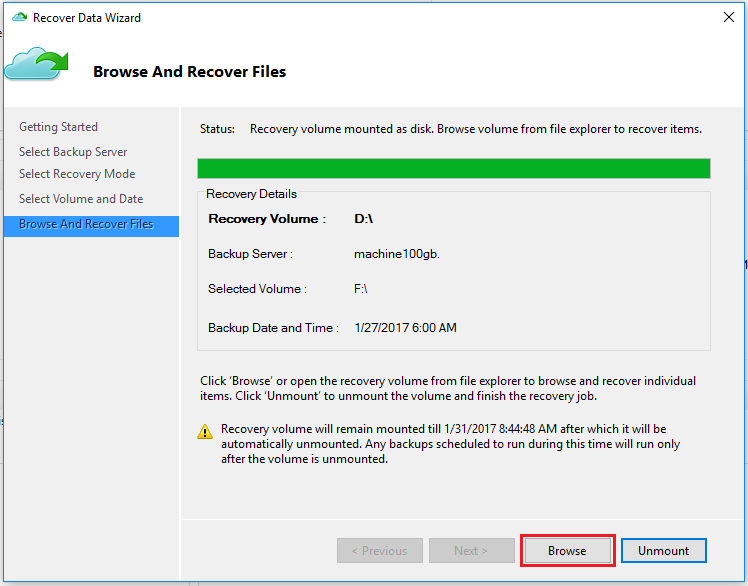 If you accidentally deleted a file and want to restore it to the same machine (from which the backup is taken), the following steps will help you recover the data. Open the Microsoft Azure Backup snap-in. 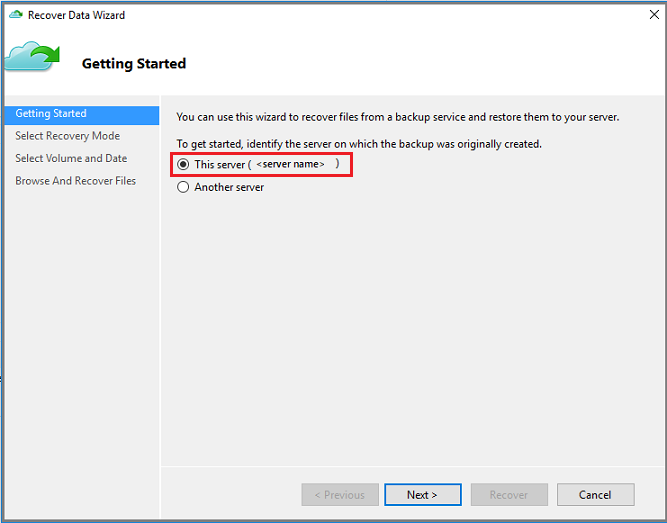 If you don't know where the snap-in was installed, search the computer or server for Microsoft Azure Backup. The desktop app should appear in the search results. Select Recover Data to start the wizard. On the Getting Started page, to restore the data to the same server or computer, select This server (<server name>) > Next. 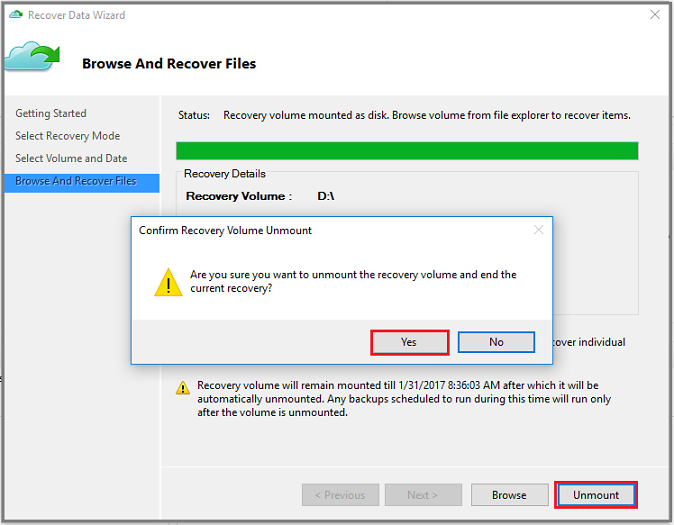 On the Select Recovery Mode page, choose Individual files and folders > Next. The option to restore individual files and folders requires .NET Framework 4.5.2 or later. If you do not see the Individual files and folders option, you must upgrade .NET Framework to version 4.5.2 or later, and try again. The Individual files and folders option allows for quick access to the recovery point data. It is suitable for recovering individual files, with sizes totalling not more than 80 GB, and offers transfer or copy speeds up to 6 MBps during recovery. The Volume option recovers all backed up data in a specified volume. This option provides faster transfer speeds (up to 60 MBps), which is ideal for recovering large-sized data or entire volumes. On the Select Volume and Date page, select the volume that contains the files and folders you want to restore. On the calendar, select a recovery point. Dates in bold indicate the availability of at least one recovery point. 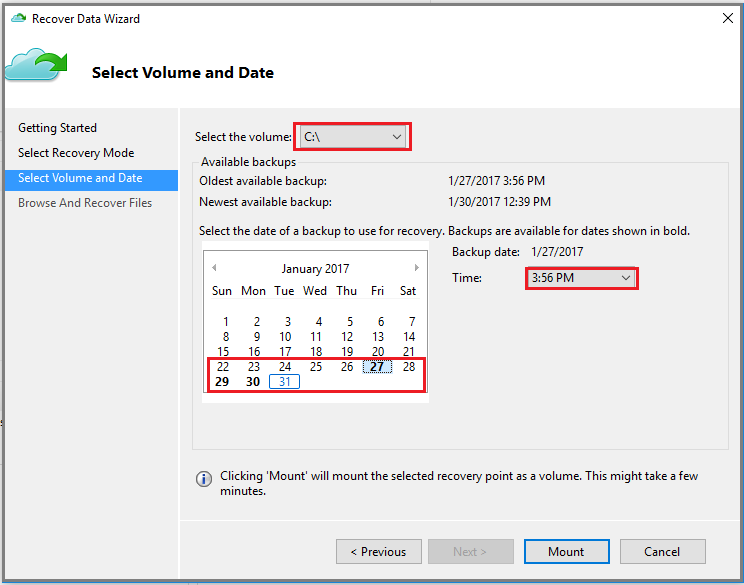 If multiple recovery points are available within a single date, choose the specific recovery point from the Time drop-down menu. After choosing the recovery point to restore, select Mount. 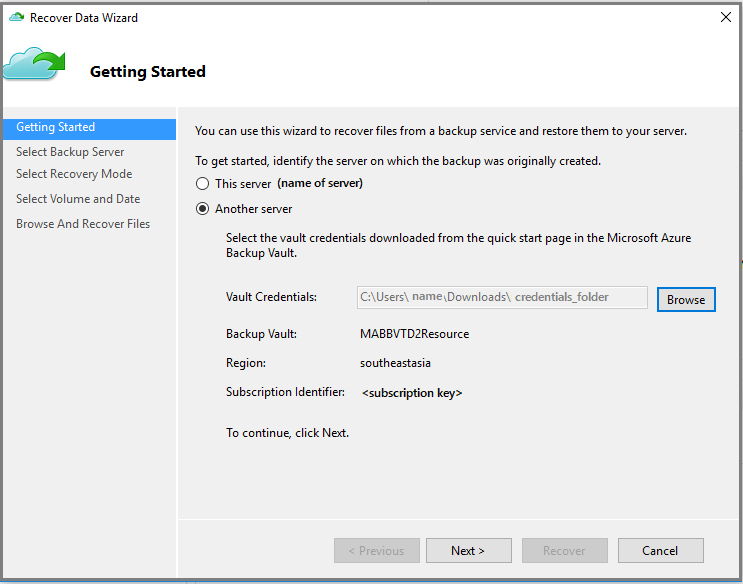 Azure Backup mounts the local recovery point, and uses it as a recovery volume. On the Browse and Recover Files page, select Browse to open Windows Explorer and find the files and folders you want. 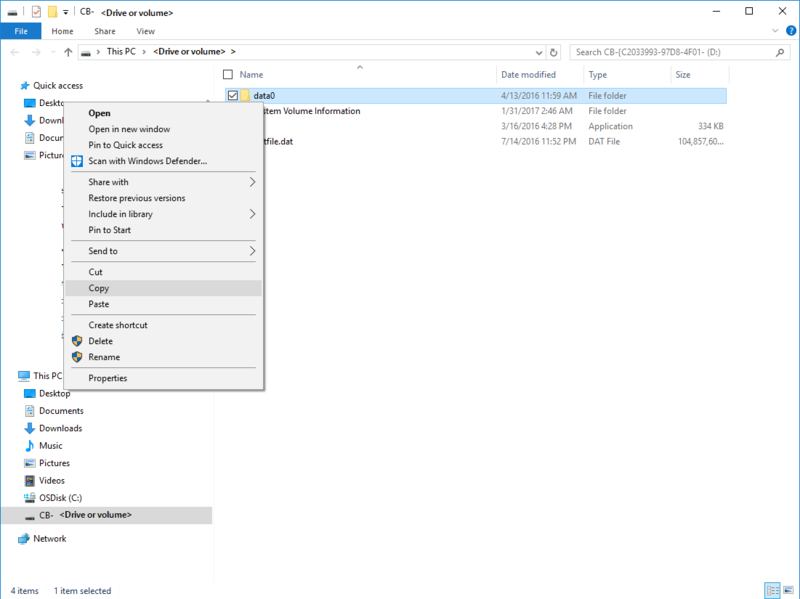 In Windows Explorer, copy the files and folders you want to restore, and paste them to any location local to the server or computer. You can open or stream the files directly from the recovery volume, and verify that you are recovering the correct versions. When you are finished, on the Browse and Recover Files page, select Unmount. Then select Yes to confirm that you want to unmount the volume. If you do not select Unmount, the recovery volume will remain mounted for 6 hours from the time when it was mounted. However, the mount time is extended up to a maximum of 24 hours in case of an ongoing file-copy. No backup operations will run while the volume is mounted. Any backup operation scheduled to run during the time when the volume is mounted will run after the recovery volume is unmounted. 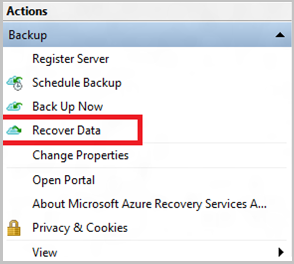 If your entire server is lost, you can still recover data from Azure Backup to a different machine. The following steps illustrate the workflow. Source machine – The original machine from which the backup was taken, and which is currently unavailable. Target machine – The machine to which the data is being recovered. Sample vault – The Recovery Services vault to which the source machine and target machine are registered. Backups can't be restored to a target machine that is running an earlier version of the operating system. For example, a backup taken from a Windows 7 computer can be restored on a Windows 8 (or later) computer. A backup taken from a Windows 8 computer can't be restored to a Windows 7 computer. Open the Microsoft Azure Backup snap-in on the target machine. Ensure that the target machine and the source machine are registered to the same Recovery Services vault. 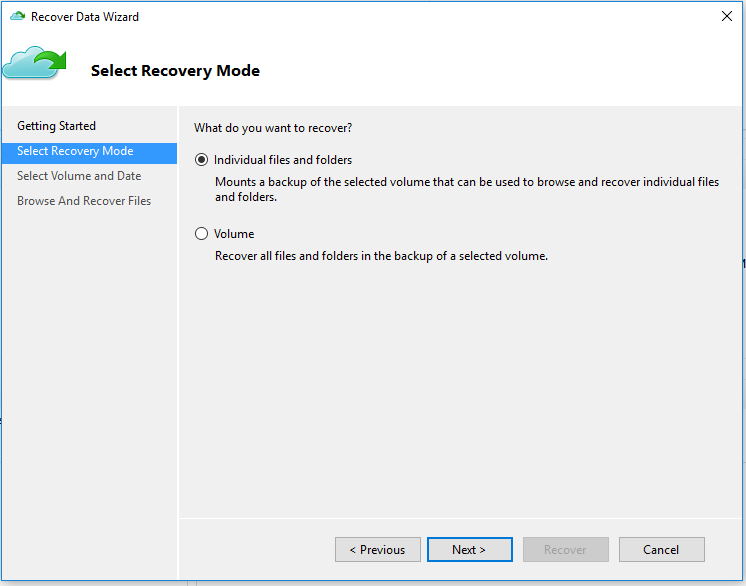 Select Recover Data to open the Recover Data Wizard. On the Getting Started page, select Another server. Provide the vault credential file that corresponds to the sample vault, and select Next. If the vault credential file is invalid (or expired), download a new vault credential file from the sample vault in the Azure portal. After you provide a valid vault credential, the name of the corresponding backup vault appears. 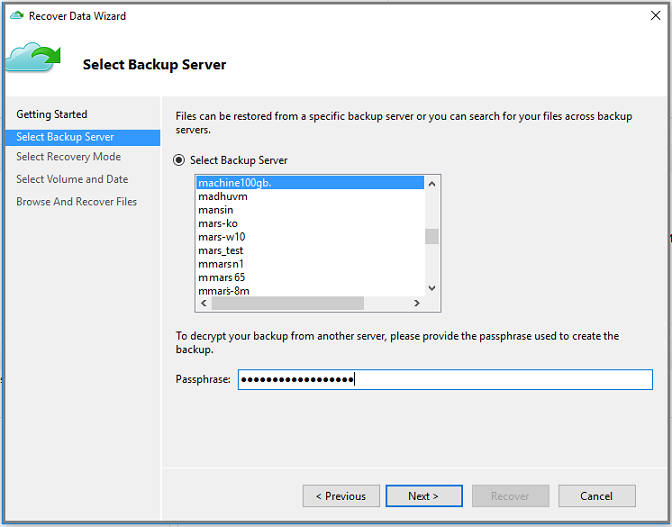 On the Select Backup Server page, select the source machine from the list of displayed machines, and provide the passphrase. Then select Next. 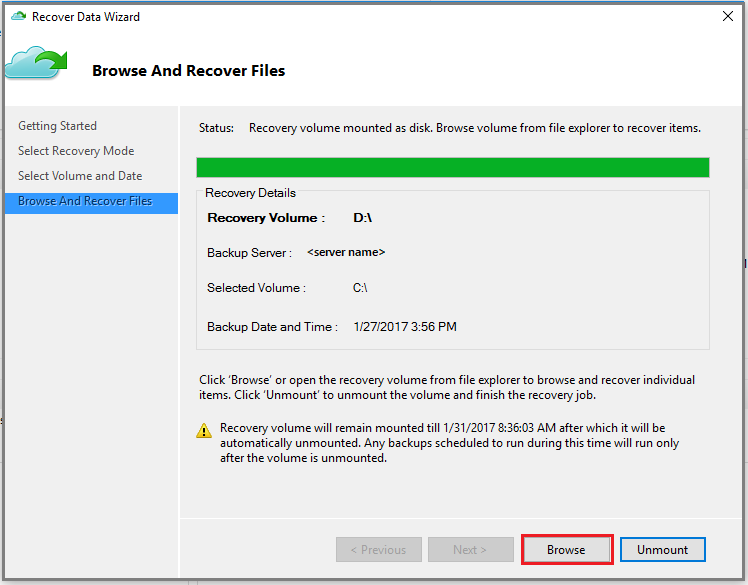 On the Select Recovery Mode page, select Individual files and folders > Next. Select Mount to locally mount the recovery point as a recovery volume on your target machine. 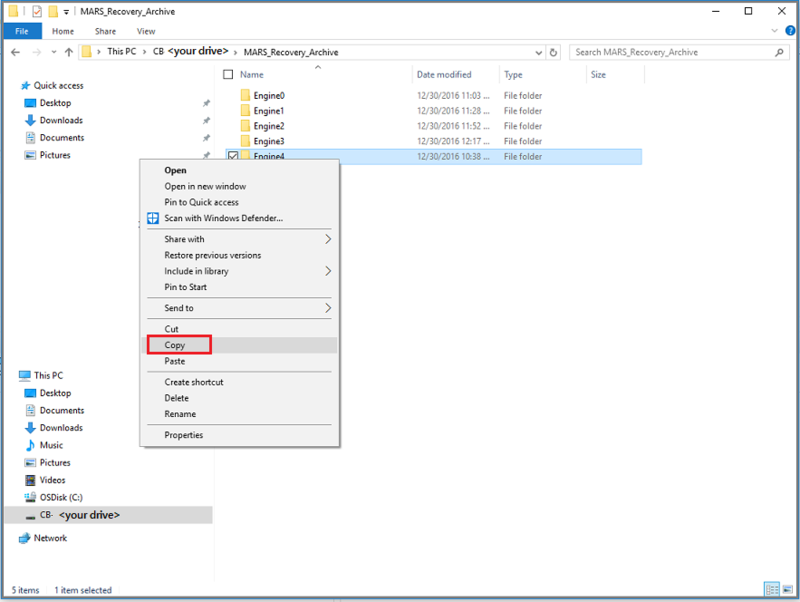 In Windows Explorer, copy the files and folders from the recovery volume, and paste them to your target machine location. You can open or stream the files directly from the recovery volume, and verify that the correct versions are recovered. Now that you've recovered your files and folders, you can manage your backups.